Mexican Shrimp Ceviche | Mexican Appetizers and More! This Mexican Shrimp Ceviche is marinated in fresh lemon and lime juice and mixed with fresh tomatoes, red onions, cucumbers, jalapenos, fresh garlic cloves and cilantro. Excellent, delicious and refreshing. CEVICHEEEEE! What can I say about this scrumptious Mexican appetizer? For one, its one of my most favorite foods!! 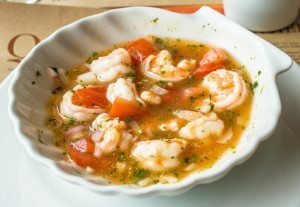 Mexican Shrimp Ceviche is soo tasteful and hyper-delicious you wonder how its made with such simple fresh ingredients! 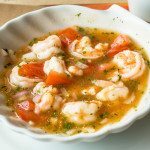 If you’ve ever ordered any ceviche recipe from a mexican menu and wondered, “how is it made?” “I wonder what they add to the shimp?” Then you may be eating this much more often from the comfort of your own home. Cause it’s super easy to make. Set the mood, a couple of “Mariachi” tunes in the background and wallaaa! This Mexican Shrimp Ceviche Recipe is made with fresh shrimp and cooked in citrus juices. Then combined with tomatoes, red onion, cucumber, cilantro and of course, jalapeño! My gosh what a divine combination! The phrase, “heaven on earth” well my friends this is it right here! Some parts of Mexico make their Shrimp Ceviche different than this one here. Some add tomato juice or clamato juice but I prefer it a little simpler. I leave out the tomato juice and focus on the true flavor of the camarón or shrimp. and a delicious vegetarian ceviche version, Mushroom Ceviche which is also an excellent side dish! Put raw shrimp in nonreactive bowl, such as a glass or plastic bowl. Pour lemon and lime juice over shrimp, toss and refrigerate covered for 2 1/2 hours. Note: The acidity in the lemons and limes "cook" the shrimp. Add all additional ingredients and refrigerate for another hour. Add hot sauce if desired to mixture. Finally add shrimp ceviche into individual martini glasses, sundae glasses or decorate bowl. Garnish with sliced lemon. Serve with tortilla chips on the side if desired. *If using jumbo shrimp, cut each shrimp into 2 to 3 pieces before marinating so the shrimp cooks evenly in juice. If you like add avocado cubes to mixture. Let me know what you think about this recipe and know how much I appreciate your input.